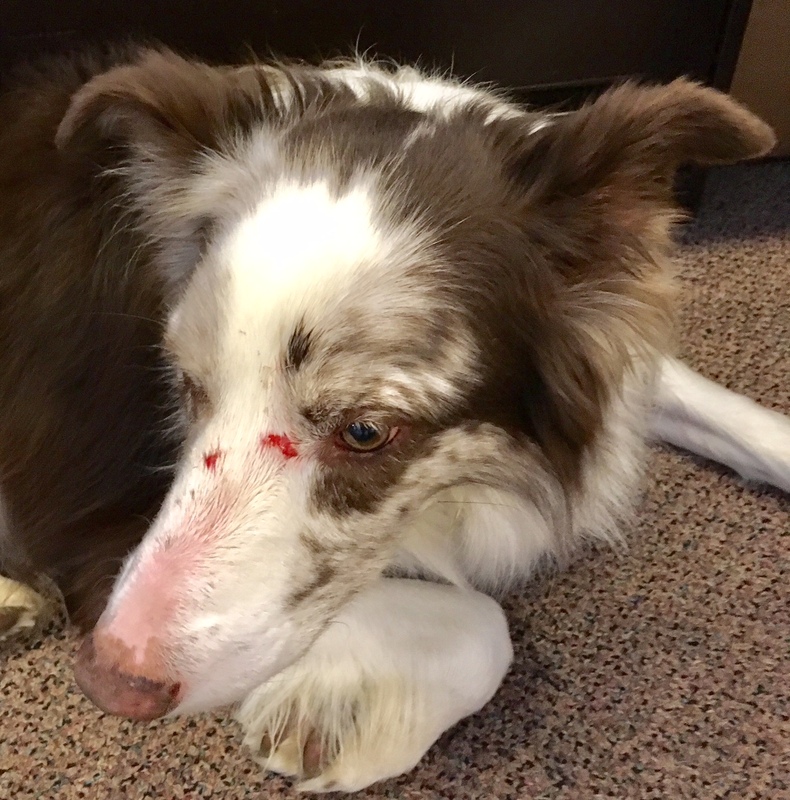 TUCKER, OUR BORDER Collie, is always getting nicked up and injured. In other words, he's a boy. A klutzy border collie? Today on our walk, Tucker jumped over, through and around a big pile of brush. He got nicked in the face and suffered a huge gash on his leg. We have him at the store today because Sheryl bandaged and wrapped his leg, and Tucker likes to chew on such things. This is the same dog that jumped out of a window in one of our upper stories and broke his leg when we first got him 5 or 6 years ago. One day Fast Eddie swiped him in the nose and gashed him really good. He's always getting into something. Lately he's been wheezing a lot and Sheryl gives him benadryl twice a day to keep the sneezing down. He's high maintenance and loves butter. Sheryl calls him expensive. I've never had a son, but I imagine boys who are athletic and like to run fast pay a price. Now that I think about it, I endured a broken leg, broken fingers and busted up nose many a time in my youth. Did Tucker inherit my klutz? Anyway, Tucker is a trooper and he doesn't try to milk it too much, unlike his late Border Collie sister, Lucy. I'm sure it's painful but he's wandering around this morning and chasing Fast Eddie like it's no big deal. Boys will be boys, you know.